The sky darkened to an eerie color around 4:30 p.m. on July 1st and I moved indoors. Suddenly—and I mean suddenly—the wind rose up. Torrential rain followed. And thunder and lightning. Wind circled around and first I was making sure all screens and doors were closed on one side of the house and then it was coming from a different direction and I ran to check the other side. Trees creaked and cracked. Limbs broke. And with one of those strikes that make you jump out of your skin, the lightning hit nearby. That’s when I checked my phone to see how much battery life was left. I saw two messages. One was an emergency weather alert: Tornado Watch. Huh? The other was from a friend warning me that there was a tornado watch for our area. Not sure what to do, I stood between the kitchen door and the downstairs bathroom, where a hatchway leads to the basement. But, there was stuff in the way and I really wanted to watch the storm. At the same time, I was frightened. Of course, in the midst of it all, the power went off. Meanwhile, across Moose Pond on Thompson Lane, Brian Fox stood on the front porch to film the action, while his wife, Lili, tried to drag him inside. My husband called me in the middle of the storm to make sure I was okay and I remember telling him I couldn’t see our porch at that point. It didn’t last all that long, as storms go, but the damage was incredible, including telephone poles left standing at 45-degree angles on the causeway. On the eastern side of the pond, the neighbors and I assessed our properties. We had downed branches and twigs. One neighbor’s float shifted north from its usual anchored spot. But what amazed us most—the view across the way. Trees had uprooted all along the western shoreline. Teamwork became essential. 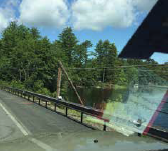 Brian had tried to drive toward Route 302 along Thompson Lane, but was stopped within 100 feet by a downed tree. He and his neighbors were able to clear the trees enough that they could drive to the end of it by around 7:30 pm that night. Of course, that meant driving through his field and another neighbor’s field further on. Their road was a total mess. There was a lot of damage, primarily to trees, but a few buildings were hit, including Harold Arthur’s garage and boat, and the Wheelers’ old woodshed next to the lake. A couple of other houses on the road ended up with trees on them but without substantial damage–one house did have part of its metal roofing blown off. At sunrise the next morning, he again stood outside, mesmerized by the beauty in the midst of such dramatic devastation. 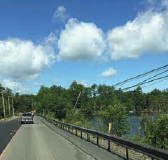 The causeway was also a mess – the Bridgton Fire Department, Central Maine Power and Fairpoint descended on the evening of July 1st and the morning of July 2nd, while Lucas Tree worked to clear Thompson Lane so power could be restored. That day, poles were reset on the causeway and power was restored to many. But for weeks the hum of generators and buzz of chainsaws filled the air. “The cleanup is still continuing today,” says Brian. 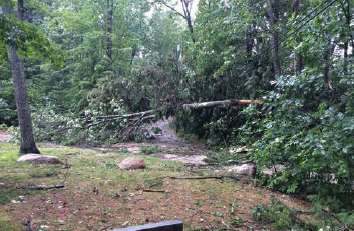 The National Weather service determined that the Shawnee Peak storm was an EF-1 Tornado with winds of 90-100 miles per hour. Another tornado also touched down on Moose Pond at the Denmark end of the lake. 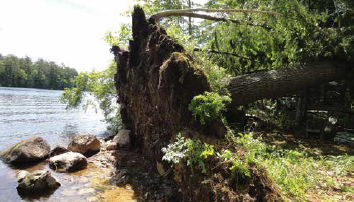 It’s unusual for Maine to have tornado warnings, but all in all it was determined that five tornadoes wreaked havoc on the lakes region that day.